50 Fun Cabin Fever Activities for Kids - Look! We're Learning! Does bad weather have you and your kids climbing the walls? We’ve been dealing with unusually cold weather down here in the South and staying inside with all four children has been…a challenge. 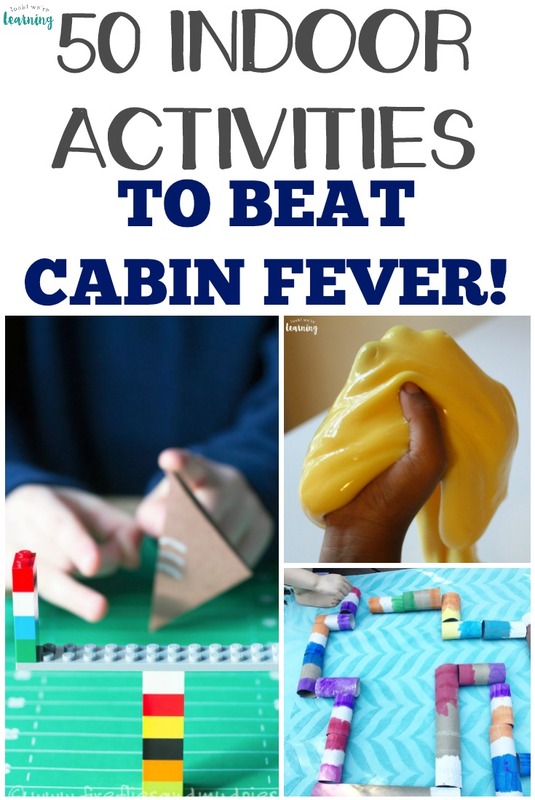 So I started looking around for some awesome cabin fever activities for kids we could try. We’ve already shared some of these with the kids and they are loving them all! We’re going to see how many we can actually use this year. And if the weather keeps being cruddy, we’ll probably end up needing them all! Want to share more fun activities with the kids? Don’t miss this list of super easy preschool crafts you can make in just ten minutes! 1. DIY Flubber – Look! We’re Learning! 11. Rainbow Playdough Mats – Look! We’re Learning! 21. Coffee Filter Hot Air Balloon Craft – Look! We’re Learning!